The remains of some of the 300 people buried in the cemetery are being analysed to see what their diet consisted of. Credit: Tim Insoll, University of Exeter. Archaeologists have uncovered an ancient, forgotten city in Ethiopia once thought to be the home of giants. The discovery reveals important new information about the origins of international trade and Islam in the country between the 10th and early 15th centuries. This is the first evidence which proves Eastern Ethiopia was well connected with the Gulf, Egypt and India hundreds of years ago and highlights how skilled craftsmen traded with communities around the world and lived alongside people from different areas around the Indian Ocean and Red Sea. 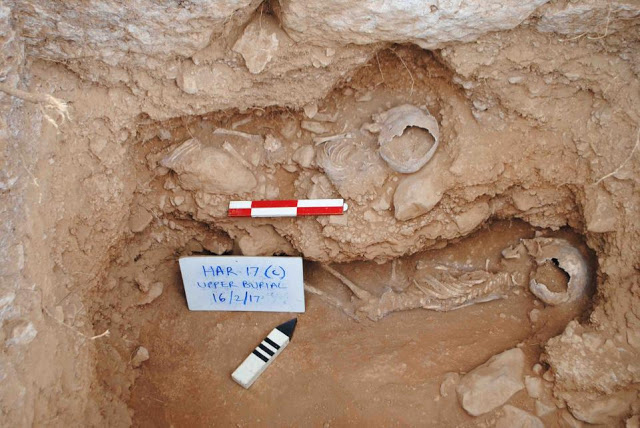 A dig in Harlaa, Eastern Ethiopia, has revealed a 12th-century mosque, evidence of Islamic burials and headstones as well as glass vessel fragments, rock crystal, carnelian, and glass beads, imported cowry shells, and pottery from Madagascar, the Maldives, Yemen and China. Archaeologists have found bronze and silver coins from 13th-century Egypt. There has so far been very little archaeological research carried out in Islamic sites in Ethiopia, with experts more focused on finding early humans in the region. Archaeologists had not previously carried out extensive work in this part of Ethiopia. Farmers had been uncovering pottery and coins for many years in the area, and were convinced there was rich information about Ethiopia’s history to be found underground. The size of some of the building stones also found created a local legend that the area had been home to giants. Archaeologists worked with the community for two years to make the discoveries, which will be exhibited in a heritage centre run by local people designed to bring income to the area. Some findings will be displayed in the country’s national museum in Addis Ababa. The work was completed in partnership with the Ethiopian Authority for Research and Conservation of Cultural Heritage. Harlaa is 120km from the Red Sea coast and 300km from Addis Adaba. The architecture of the mosque is similar to those found in Southern Tanzania and Somaliland, showing connections between different Islamic communities in Africa. Remains found in the dig suggest jewellers were making high-quality, delicate pieces in silver, bronze and semi-precious stones and glass beads. They used some technology usually associated in that period with jewellers in India, suggesting trade or immigration from that country to Harlaa. The settlement, which is around 500m by 1,000m, has buildings and walls constructed with large stone blocks – leading people to assume only those with enormous stature or strength could have built it, and encouraging local legends about giants having inhabited the region. The remains of some of the 300 people buried in the cemetery are being analysed to see what their diet consisted of. The research is funded by the European Research Council and previously by the Max Van Berchem Foundation in Switzerland. The archaeologists, from the Universities of Exeter, Addis Ababa and Leuven, will dig again next year, in other sites and deeper underground, to uncover more evidence of people who lived there earlier in history. So far, they have excavated down to a depth of 2.5 metres and dated this to the 6th century.